A 19-year-old man was injured after the driver of a 2007 Honda Fit ran a red light and struck his 2005 Chrysler Pacifica at about 2:40 a.m. Sunday, Oct. 7, in the 4000 block of North Cumberland Avenue, according to the Chicago Police Department Office of News Affairs. A 27-year-old man was driving the Honda south on Cumberland at a high rate of speed and struck the Chrysler as it was driving east on Irving Park, according to police. 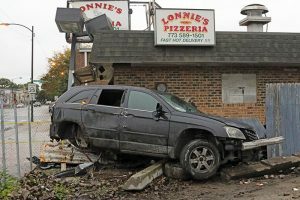 The Pacifica then struck and went through a CTA bus shelter, hit a utility pole and rested within inches of Lonnie’s Pizzeria, 8343 W. Irving Park Road, police said. The driver of the Pacifica was transported to Lutheran General Hospital, according to police. Reportedly, no one was cited in the accident, police said.